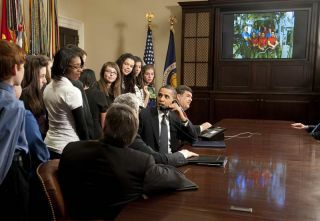 U.S. President Barack Obama, with middle school children, prepares to hand over the phone to a student to ask a question to astronauts on the International Space Station during an event in the Roosevelt Room of the White House, Wednesday, Feb. 17, 2010 in Washington. President BarackObama quizzed astronauts aboard the International Space Station about life in orbitWednesday and said he was committed to continuing the United States' space exploration program,even as NASA?s plans for human spaceflight are in flux. In the cosmic phone call fromthe Roosevelt Room at the White House, President Obama congratulated the 11astronauts aboard the linked space station and shuttleEndeavour on their work to bring the $100 billion orbiting laboratory?snear-completion. ?It?s just a testimony tohuman ingenuity. A testimony to the extraordinary skill and courage that youguys bring to bear, and it?s also a testimony to why continued spaceexploration is so important,? President Obama said. ?It?s part of the reasonwhy my commitment to NASA is unwavering.? Earlier this month, PresidentObama unveiled his 2011 budget request for NASA, which would scrap the spaceagency?s plans to replace its shuttle fleet with new spacecraft to send humansinto orbit and on toward the moon. A new long-range plan is under development,NASA officials have said. Instead, the presidentordered NASA to embrace commercially built spaceships to launch astronauts intospace and pledged to set aside $6 billion over the next five years to support privatespaceflight. The budget request also extended the International Space Stationthrough at least 2020, a five-year reprieve. President Obama asked theastronauts what types of research the station?s extension and new additions willallow. Station astronaut Timothy ?T.J. ?Creamer said the space station?s best contribution to science is its weightlessenvironment, which allows a wide range of experiments in flame science, cellularbiology for new medicines and new materials research to name a few. ?Long-duration living and workingin space is what the space station is all about to do the research and sciencenecessary to take us beyond low-Earth orbit,? the space station?s Americancommander Jeffrey Williams added. Endeavour?s six astronautsand the five-man station crew are in the home stretch of their joint mission toadd a new room and stunning observation deck to the space station. With them, the space station is about 98 percent complete after 11 years of construction. The newadditions were launched last week, with the astronauts opening up the station?snew bay window ? which offers stunning panoramicviews of Earth ? early Wednesday. ?Everybody here back home isexcited about this bay on the world that you guys are opening up,? PresidentObama said. ?Stephen Colbert at least is excited about his treadmill.? Colbert, the TV funnyman andhost of Comedy Central?s ?Colbert Report,? won a NASA voting contest to havethe station?s new room named after him last year. NASA opted to name thebus-sized module Tranquility instead to honor the historic Apollo 11 moonlanding site. But the space agency named anew astronaut treadmill after Colbert as a consolation prize. It will be movedinside the new Tranquility module, which serves as a gym, life supportequipment hub and robotic arm workstation. President Obama also turnedhis phone over to middle school students from Michigan, Florida, North Carolinaand Nebraska who were visiting Washington, D.C., for an engineering competition. The students asked whatastronauts could see from space (Answer: the Golden Gate Bridge, city lights atnight and other things), and what it takes to be a spaceflyer. They also askedif it will ever be possible to create artificial gravity in space. ?That?s a big physicsquestion there, anyone want to tackle that one?? President Obama said with achuckle. Spinning things, like centrifuges,could do the trick, the astronauts said. The president said he looksforward to setting aside funding to support the development of new technologiesor vehicles that could open up the solar system for exploration. Endeavour?sastronaut crew is slated to move a set of four bulky life support equipmentracks, each the size of a large refrigerator, into the station?s new Tranquilityroom late Wednesday. The shuttle launched Feb. 8and is due to return to Earth Sunday night. Endeavour?s flight is thefirst of NASA?s five final shuttle missions before the agency retires itsorbiter fleet in the fall. POLL: Is Abandoning NASA's Moon Plan the Right Choice?